THAL-XOR developed two web-GIS services: one for the area of Cyprus (the EEZ of Cyprus including detailed zoom on the coastal and marine area of Limassol) and a second one for the Aegean Sea in Greece (Regions of North and South Aegean Sea and Region of Crete), including two detailed zooms on Lesvos and Rhodes islands. Besides mapping most relevant maritime uses, the web-GIS services were used to dynamically visualise conflicting interactions (considering both maritime and land-based activities and uses) and derive density activity maps and/or conflicts maps. During THAL-CHOR, data collected and the web-GIS services were made available via the project website to share results and engage stakeholders. What are relevant spatial data to be considered to support MSP and ICZM implementation at regional and sub-regional level? How can web-GIS be used to support the development of MPS pilot plans? How can spatial data be used to derive maps of human activity density and conflicts among uses? The web-GIS platform (including two web-GIS services) for implementing MSP in Greece and Cyprus was developed within the project “ΘΑΛ-ΧΩΡ - Cross border cooperation for Maritime Spatial Planning Development” (THAL-CHOR) aimed to the development of MSP methodology and its pilot implementation for drafting marine spatial plans in selected areas of Cyprus (Limassol area) and Greece (Islands of Lesvos and Rhodes). Resolution of spatial conflicts between different uses of the sea and coastal areas, better coordination between stakeholders, strengthening cross-border cooperation, and creation of conditions for achieving sustainable development in line with the strategy "Europe 2020”, were other specific THAL-CHOR objectives. THAL-CHOR was funded by the Cross-Border Cooperation Programme “Greece-Cyprus 2007-2013”; the project duration was from February 2014 to December 2015. Within the context of the THAL-CHOR project, the web-GIS services were used to map relevant maritime uses in the overall project areas: (i) the EEZ of Cyprus, including detailed zoom on the coastal and marine area of Limassol, where a pilot marine spatial plan was developed; (ii) the Aegean Sea (Regions of North and South Aegean Sea and Region of Crete), including two detailed zooms on Lesvos and Rhodes islands, where pilot marine spatial plans were developed. The web-GIS services were also used to analyse and dynamically visualise conflicting interactions and derive density activity maps and/or conflicts maps. Moreover, during the project, the web-GIS services were made available via the THAL-CHOR website upon request by the users to share results and support stakeholders’ engagement. The methodology included a first phase focusing on stock-taking of existing information and its updating with some new data, related to the following main categories: environment, geography and geomorphology, physical processes, sea water quality, maritime transportation, urban development, nature and cultural protection, social and demographic characteristics, economic activities and energy resources. Collected geo-data were then structured into two web GIS services (one for Cyprus and another for Greece) enabling their visualisation. The web-GIS system was designed in Oracle / Oracle Spatial environment. This environment is an open access platform that can support interoperability between different GIS formats. For the communication of the system with other external systems OGC standards are also supported. In addition, the system can support exports in a variety of international recognized standards (such as shapefiles, CAD, KML, etc.) being able to be used by other services. The use of open data source approach was followed to minimize the future cost of hosting the platform. It should be also noted that the raw data were gathered, digitized, corrected and georeferenced prior to any spatial analysis or visualization process. The web-GIS services for Cyprus and Greece were one of the main outputs of THAL-CHOR project. 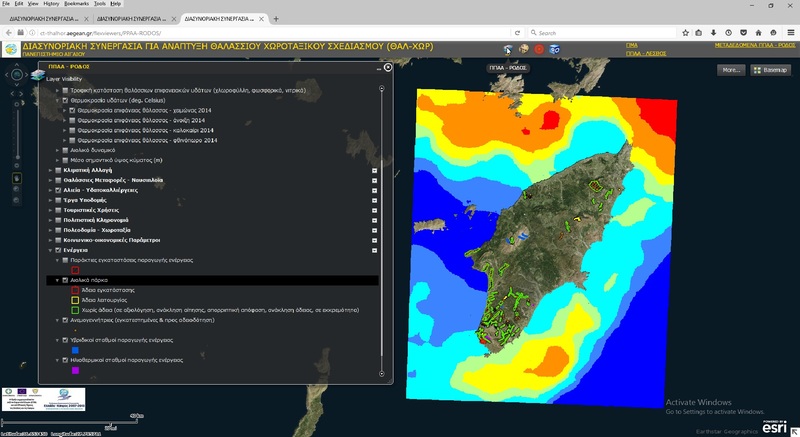 For Cyprus two web-GIS applications have been specifically developed: the first is related to conflict and density activity maps for the whole EEZ of Cyprus, while the second application deals with spatial information on marine and coastal activities of the island. The first web-GIS application is publicly accessible on line while the second is accessible upon request and permission access. For Greece three web-GIS applications have been specifically developed for the visualization of marine and coastal activities in: (i) the Aegean Sea (Regions of North and South Aegean and Region of Crete), (ii) the island of Lesvos and (iii) the island of Rhodes. 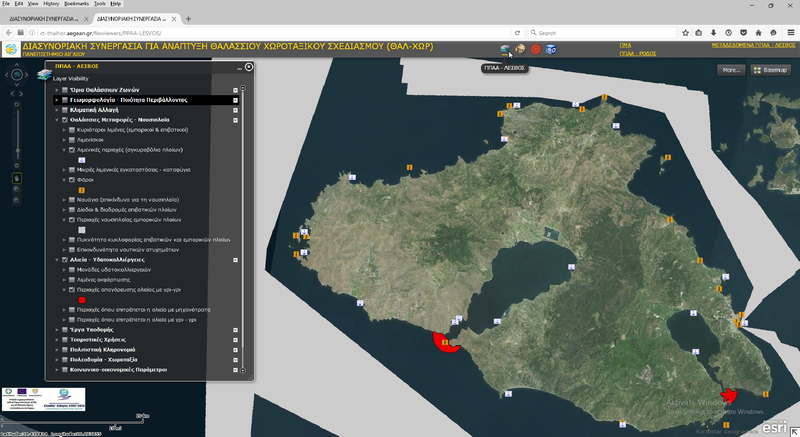 For Lesvos and Rhodes islands the spatial information provided is more detailed and in higher resolution. The web-GIS applications are accessible on-line upon request and permission access. For Cyprus, they include: satellite images, thematic maps, density activity maps and conflict maps. Maps refer to more than 60 different activities, uses or characteristics of the coastal and marine systems, as for example: anchorages, artificial coastline, artificial reefs, coastal protection zone, danger lines, desalination plants, dumping areas, energy facilities, fish farms, fish nursery areas, ports and port regulation, natural areas and coastlines, nitrate vulnerable zones, pipelines, planning zones, Posidonia meadows, quarrying leases, restricted fishing areas, sea life protected areas, shipping routes, swimming area limits, underwater cables, waste treatment plants, wrecks, etc. For the Aegean Sea, they include maps on: marine boundaries, climatology, geomorphology, oceanography, environmental quality parameters (e.g. chlorophyll), Natura 2000 sites and other protected areas, oil spills, ports and maritime transportation, fishery and aquaculture, coastal and marine infrastructure (e.g. desalinisation plants, wastewater plants, airports, submarine cables), sea energy resources and other energy related aspects, tourism, coastal and underwater cultural heritage, marine spatial planning maps, socio-economic aspects. Similar maps were produced for the detailed zooms on Lesvos and Rhodes islands. The web-GIS services are maintained by the project’s partners that were responsible for their development, namely the Cyprus University of Technology (for Cyprus web-GIS service) and the University of Aegean (for Greece service). The methodological approach used by THAL-CHOR project and specifically in developing the related web-GIS service can be considered a standard approach to be capitalised in other areas/projects sharing similar objectives. Maps and spatial layers available through the web GIS might be useful for other initiatives, dealing for example with environmental impact assessment, scoping analysis for business development and investment, tourism and other sector planning, etc. Funding Source: the web-GIS platform for implementing MSP in Greece and Cyprus were developed within the THAL-CHOR project, which was funded under the Cross-Border Cooperation Programme “Greece-Cyprus 2007-2013”. Costs: for the development of the Cyprus Web-GIS service a budget of about 80.000 euros was allocated. The budget also includes resources needed for the pre-elaboration and correction of spatial data. In total 5 researchers were involved in this task. For the development of the Greek web-GIS service a budget of about 70,000 euros was allocated and 3 researches were involved.